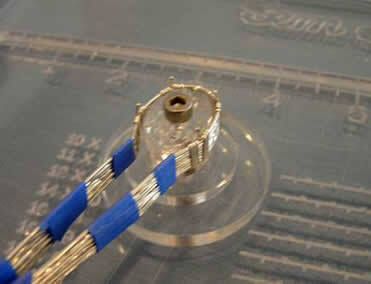 I am using 18 gauge wire, this way it is easily seen. I made marks on my Advanced Gem Bead Board. The marks for gemstones are there for you beneath the line. 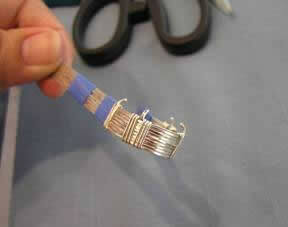 For your project you will need to cut your wire 1 inch longer than the rest of the wires you cut. 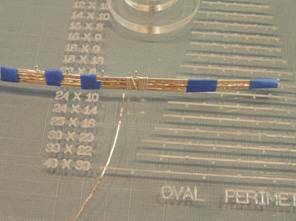 You will be using 22 g. practice wire or 22g. ½ round ½ hard Sterling Silver. Measure 3 inches and make a 90 degree angle. Note: When making your Sterling Silver Prongs remember that the Sterling Silver half round wire flat shiny side will be on the inside of the prong. Depending on the gemstone you may need to adjust for the prong to fit. 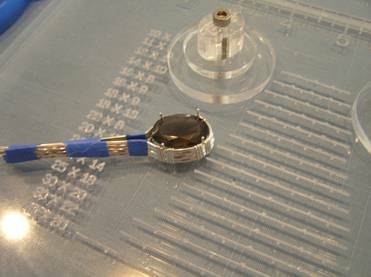 The easy way to gauge the prong size is to hold your flat nose pliers against the gemstone around the girdle and then see how far you want it on the gemstone crown. Make a U-Turn, then squeeze. After the 4 prongs are done, check to make sure they line up with the prong marks. Now you are ready to make a 45 degree angle for the prongs. 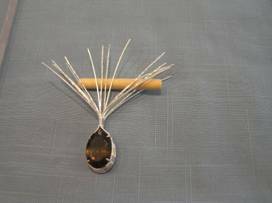 Here is the 22 g. ½ round ½ hard sterling silver prongs on the Gem Board. The prongs line up nicely with the four prong markings that are beneath the line. Normally gemstones are a lot smaller than 20 x 15mm. I used 21ga square ½ hard wire. I twisted 4 of the wires. Since the length was too long to manually twist, the drill worked better. Bind your 4 wires together. (21 g. square ½ hard Sterling Silver wire). The prong wire is on top. (22g. ½ round ½ hard Sterling Silver wire). Put the 5 wires together and put painters tape around all 5 to keep the wires parallel. 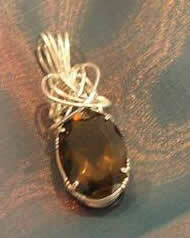 Note: When putting the Sterling Silver ½ round on the top the flat shiny side will be on the square wire. Make a right angle place under your pliers to hold the wire tighter and steadier as you wind it around the taped wires. Squeeze the wires on each side of the bindings with your pliers to give a tighter binding fit. Wrap it around tightly 3 to 4 times close to the prong. On the inside you slide the wire to the other side of the prong. Adjust the wires, cut with the flush side of the cutters, this will give a smoother cut. With the flat nosed pliers press the cut ends down into the wire to prevent sharp edges. These edges will not show since they will be on the inside. 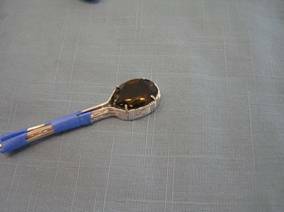 Take off the tape around the prongs. 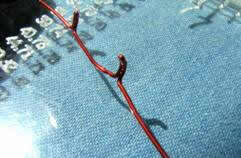 Make a slight straight bend in all your wires, using the Plastic Jaw Pliers. 1/16 inch to the outside of the line and mark, this is wire size allowance.. Put the middle binding at the top of the guide. Line it up with the 12 o’clock mark on the guide. Check the wire wrap for size. I bent the prongs at a 45 degree angle. Do a size check and make adjustments to the prongs. Tape all the wires back together with Gemstone in place. Tape just above where the binding wires will be wrapped. 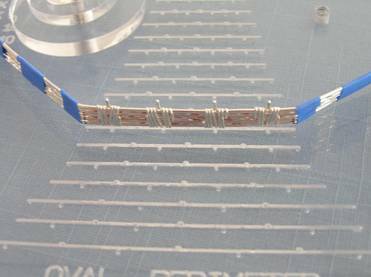 Cut 2 inches of 22 gauge ½ round sterling silver wire and wrap around the top about 4 to 5 wraps to bind together, keeping both sets of 4 wires parallel to each other.